Many babies are born with jaundice that results from an elevated bilirubin level in their bodies. Jaundice is easily diagnosed and highly treatable if signs are observed immediately. It is critical that doctors detect signs of jaundice in newborns to prevent the condition from escalating to bilirubin-induced brain damage called kernicterus. Additionally, neonatal jaundice can lead to other problems, including cerebral palsy, neurological disorders, and even death. There are several laboratory tests that can be performed to confirm hyperbilirubinemia. If jaundice appears within the first 24 hours of the baby’s birth, it is serious and should be treated immediately. If jaundice becomes apparent 48-72 hours after the birth, it is called physiological jaundice, which is common and less serious. Exchange transfusion is used to replace the blood that has a high bilirubin level with fresh blood that has a normal bilirubin level. 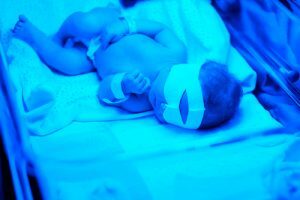 Because bilirubin absorbs light, jaundice and increased bilirubin levels tend to decrease when the baby is exposed to special blue lights. Phototherapy, which may take several hours to begin working, can be used throughout the day and night. A fiberoptic blanket can be placed under the baby, and can be used alone or in a combination with phototherapy. Baby is given adequate hydration with breastfeeding or pumped breast milk. Hyperbilirubinemia must be treated immediately to prevent it from escalating into kernicterus. Kernicterus is a type of brain damage that occurs from a high level of bilirubin in baby’s blood. The condition is rare in full-term healthy infants, even if the baby was born with jaundice. If your child has been diagnosed with kernicterus, you should immediately consult with an attorney who handles birth injuries to determine whether or not the medical staff was negligent. Hyperbilirubinemia, if timely diagnosed, should not result in kernicterus or brain damage. If your newborn has been diagnosed with a condition such as cerebral palsy, seizures, or mental retardation as a result of kernicterus, you may be entitled to compensation due to medical malpractice. Thurswell offers free consultations for birth injury cases. Call Thurswell today at 248-354-2222 to discuss your family’s case. We will not charge an attorney fee unless your case is won and you collect money!